Seated Buddha, from the Chinese Tang dynasty, Hebei province, ca. 650 CE. Buddhism in China is of the Mahayana tradition, with popular schools today being Pure Land and Zen. In Buddhism, a buddha (Sanskrit बुद्ध) is any being who has become fully awakened (enlightened), has permanently overcome greed, hate, and ignorance, and has achieved complete liberation from suffering. Buddhists consider enlightenment, also called nirvana (Pali nibbana), the highest form of happiness. Siddhartha Gautama (Pali Siddhattha Gautama), the historical founder of Buddhism, is often referred to as "Buddha", or "the Buddha". The word buddha literally means "awakened" or "that which has become aware". It is the past participle of the Sanskrit root budh, meaning "to awaken", "to know", or "to become aware". Buddha as a title may be translated as "The Awakened One". The teachings of the Buddha are called the Dharma (Pali: Dhamma). The Dharma teaches that all suffering arises from attachment, particularly attachment to worldly desires. Nirvana is attained by learning to achieve peace of mind by overcoming the attachment one has to various material objects as well as emotional desires such as envy, greed, lust, and pride. 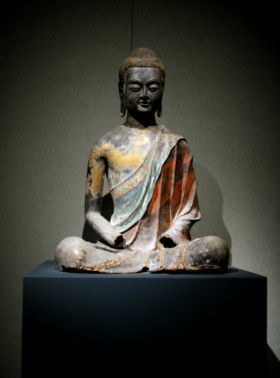 A common misconception views Buddha as the Buddhist counterpart to “God”; Buddhism, however, is non-theistic (i.e., in general it does not teach the existence of a supreme creator god (see God in Buddhism) or depend on any supreme being for enlightenment; Buddha is a guide and teacher who points the way to nirvana). The commonly accepted definition of the term "God" describes a being that not only rules but actually created the universe (see origin belief). Such ideas and concepts are disputed by Buddha and Buddhists in many Buddhist discourses. In Buddhism, the supreme origin and creator of the universe is not a god, but Avidya (ignorance). Buddhists try to dispel this darkness through constant practice, compassion and wisdom (known as prajna). In the Pali Canon, the term 'buddha' refers to anyone who has become enlightened (i.e., awakened to the truth, or Dharma) on their own, without a teacher to point out the Dharma, in a time when the teachings on the Four Noble Truths or the Eightfold Path do not exist in the world. Generally, Buddhists do not consider Siddhartha Gautama to have been the only buddha. The Pali Canon refers to Gautama Buddha at least once as the 28th Buddha (see List of the 28 Buddhas). A common Buddhist belief is that the next Buddha will be one named Maitreya (Pali: Metteyya). Buddhism teaches that anyone can become awakened and experience nirvana. Theravada Buddhism teaches that one doesn't need to become a Buddha to become awakened and experience nirvana, since an Arahant (Sanskrit: Arhat) also has those qualities. Some Buddhist texts (e.g., the Lotus Sutra) imply that all beings will become Buddhas at some point in time. 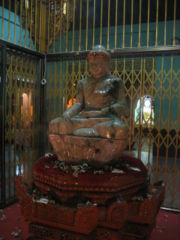 In the Pali Canon, there are considered to be two types of buddha: samyaksambuddhas (Pali: sammasambuddhas) and pratyekabuddhas (Pali: paccekabuddhas). 2. Pratyekabuddhas, sometimes called 'silent Buddhas') are similar to samyaksambuddhas in that they attain nirvana and acquire the same powers as a samyaksambuddha, but choose not to teach what they have discovered. They are considered second to the samyaksambuddhas in spiritual development. They do ordain others; their admonition is only in reference to good and proper conduct (abhisamācārikasikkhā). In some texts, the pratyekabuddhas are described as those who understand the Dharma through their own efforts, but obtain neither omniscience nor mastery over the 'fruits' (phalesu vasībhāvam). The disciple of a samyaksambuddha is called a savaka ("hearer" or "follower") or, once enlightened, an arahant. These terms have slightly varied meanings but can all be used to describe the enlightened disciple. Anubuddha is a rarely used term, but was used by the Buddha in the Khuddakapatha to refer to those who become Buddhas after being given instruction. Enlightened disciples attain nirvana and parinirvana as the two types of Buddha do. Arahant is the term most generally used for them. One 12th century Theravadin commentary uses the term 'savakabuddha' to describe the enlightened disciple. According to this scripture there are three types of buddhas. In this case, however, the common definition of the meaning of the word buddha (as one who discovers the Dharma without a teacher) no longer applies. Mainstream Theravadin and Mahayana scriptures do not recognize this term and state that there are only two kinds of Buddhas. 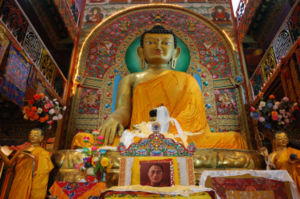 A statue of the Sakyamuni Buddha in Tawang Gompa. the Blessed One or fortunate one. These characteristics are frequently mentioned in the Pali Canon, and are chanted daily in many Buddhist monasteries. All Buddhist traditions hold that a Buddha has completely purified his mind of greed, aversion and ignorance, and that he is no longer bound by Samsara. A Buddha is fully awakened and has realized the ultimate truth, the non-dualistic nature of life, and thus ended (for himself) the suffering which unawakened people experience in life. From the Pali Canon emerges the view that Buddha was human, endowed with the greatest psychic powers ( Kevatta Sutta). The body and mind (the five khandhas) of a Buddha are impermanent and changing, just like the body and mind of ordinary people. However, a Buddha recognizes the unchanging nature of the Dharma, which is an eternal principle and an unconditioned and timeless phenomenon. This view is common in the Theravada school, and the other early Buddhist schools. Some schools of Mahayana Buddhism believe that the Buddha is no longer essentially a human being but has become a being of a different order altogether and that, in his ultimate transcendental "body/mind" mode as Dharmakaya, he has eternal and infinite life and is possessed of great and immeasurable qualities. In the Mahaparinirvana Sutra the Buddha declares: "Nirvana is stated to be eternally abiding. The Tathagata [Buddha] is also thus, eternally abiding, without change." This is a particularly important metaphysical and soteriological doctrine in the Lotus Sutra and the Tathagatagarbha Sutras. According to the Tathagatagarbha Sutras, failure to recognize the Buddha's eternity and - even worse - outright denial of that eternity, is deemed a major obstacle to the attainment of complete awakening ( bodhi). In the Pali Canon there is frequent mention of a list of 32 physical marks of Buddha.